NOTE: Please read (or save and print out) the Word document attached at the bottom of this article - it includes step by step instructions as well as the label itself, ready for data entry. You can choose to print it out as a blank form and fill it in by hand, using a fine tipped pen, or edit the entries on your computer and then print. 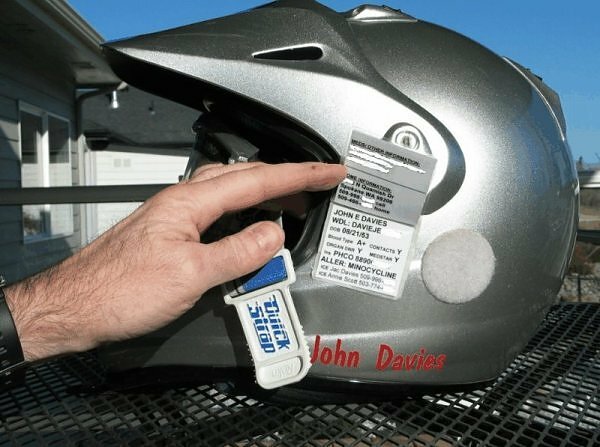 You must then HOT LAMINATE the tag to keep the data protected from the weather. Cold lamination isn't really rugged enough for the hinge to work - the glue isn't very good. This tag is quite stout - it is possible to pull the hinge apart, but you really have to work at it. 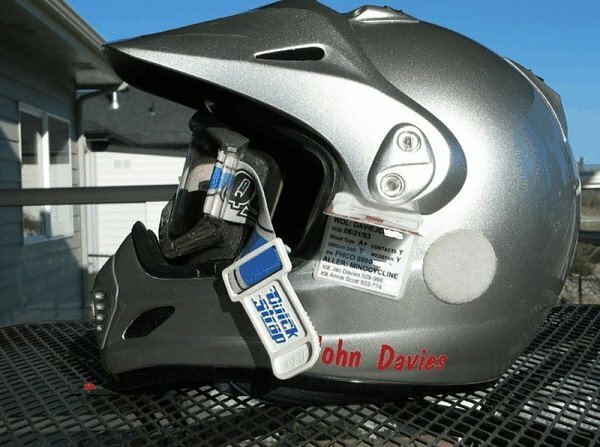 Following are pics showing how to make the label, and how to mount it on your helmet and bike. Be sure to enter your data FIRST! Fold Page 3 along the bottom edge of the graphic. 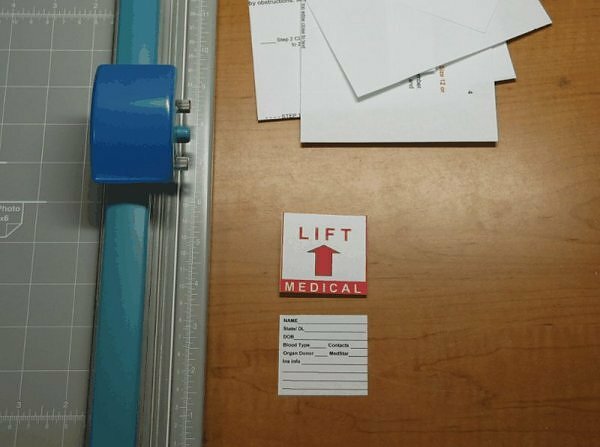 The paper cutter to the left is an inexpensive manual photo trimmer. You can use scissors, but it will be harder. Trim around the perimeter while it is folded, making a neat 2 inch x 2 inch square. Trim Page 4, making sure the height is about 1/8 inch less than the cover flap so it's easy to open. Hot laminate the top piece one time. Don't worry if there are a few hazy spots. If there are a lot, turn up the heat and retry in a minute. Hot laminate the lower piece one time. Trim both pieces, TOP AND BOTTOM ONLY, within about 1/16 inch of the paper. Do NOT trim the sides yet. Note the piece in the trimmer (the bottom one) which is cut at about 1 7/8 inches high. Insert the two pieces in the correct orientation, aligning the paper edges nicely, into another sleeve. LEAVE 1/8 inch of extra sleeve showing AT THE TOP - this will act as the hinge. The sleeve fold isn't strong enough by itself and will tear easily. Don't worry about clearance elsewhere - it will all be trimmed away later. Hot laminate the final assembly once. Immediately rotate the still-warm tag 90 degrees and feed it through again, to remove any hazy spots and really seal the adhesive on all the layers. Allow it to cool for 30 seconds before trimming. If you try to open it at this point, you probably won't be able to. Trim the sides and bottom to within 1/16 inch of the paper. Don't expose the paper or it won't be waterproof! DON'T TRIM THE HINGE!!! That's what makes the tag work. Pry it open by inserting a finger into one of the open side slots - the bottom will be stuck together! 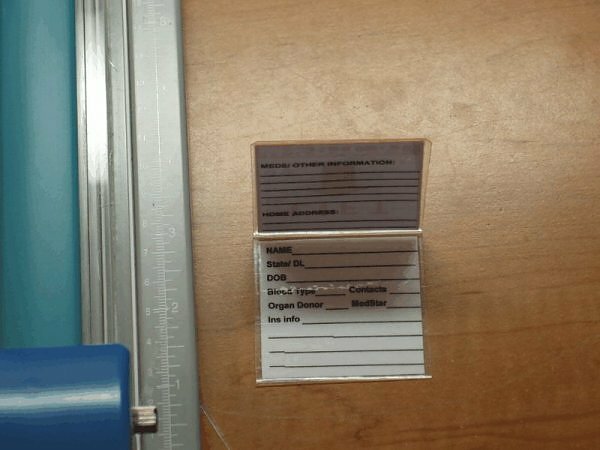 The finished tag, with the corners taken off. Add heavy duty double sided carpet tape before trimming, if that will be your method of attachment, to make it neater. Or just trim the tape using scissors later. The tag mounted on my Arai XD helmet. The front and back edges are not yet taped with 1/2 inch clear 3M Scotch tape. The extra tape prevents the tag from moving around and helps seal the inside. It also prevents the Quick Strap from ripping off the flap! When the goggle strap is freed, the tag is highly visible. 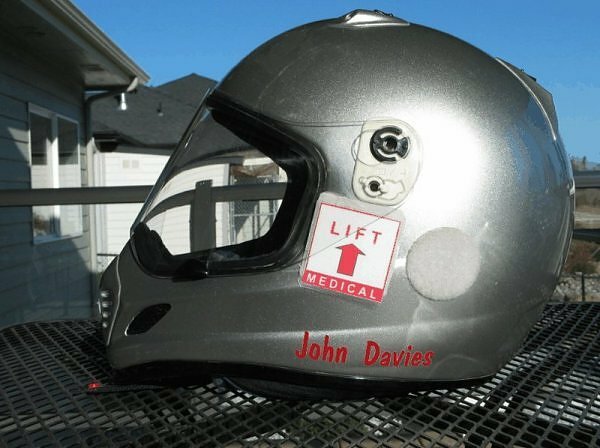 Lift the flap and the upper portion will stay open at about 100 degrees, depending on curvature of the helmet and any obstructions. The upper part sort of "over-centers" and locks into place. 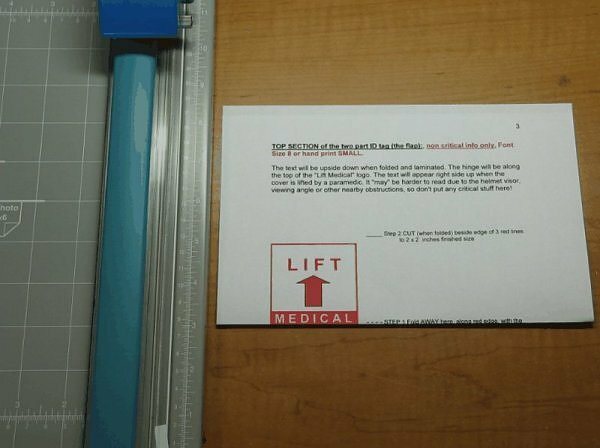 Lifting the flap fully reveals the non-critical info under the graphic. 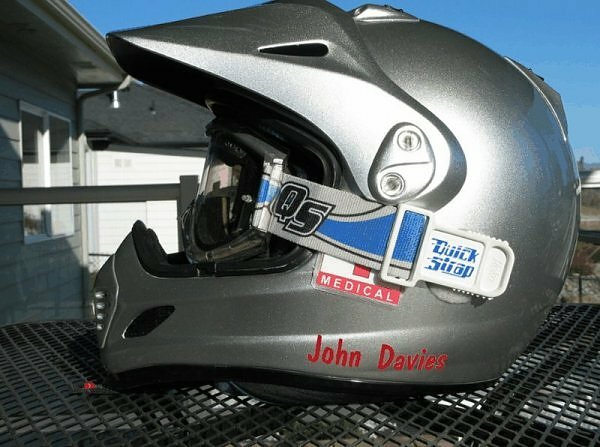 The tag will even work under a face shield, but it looks a little strange. The fender tag mounted behind my tool bag, where it is protected and away from splashes and impacts. 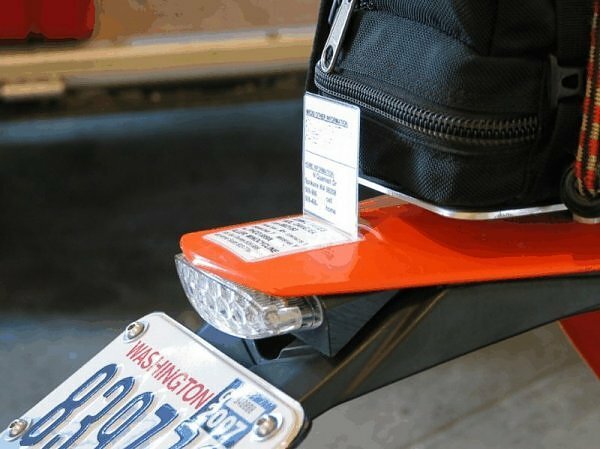 It's really close to the license plate, because that is the one other place emergency techs will be most likely to check after stabilizing the victim. Again, it will be secured with clear tape along both sides. Flipped up, it remains open by itself and highly readable. Again, the curvature of the mounting area affects this feature. The tag won't work on tight curves because the double backed tape will just try to pull off. Full sized image of the cover graphic. 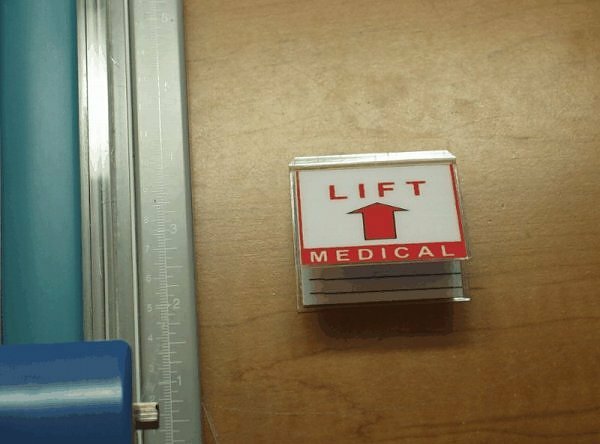 It prints out at 100% scale to 2 x 2 inches exactly. 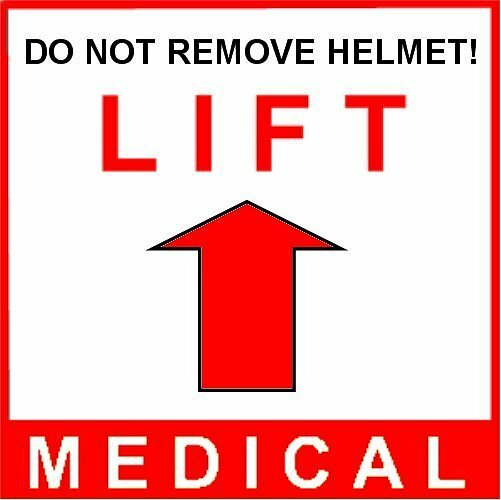 EDIT 04-04-07: This is the updated graphic with the "Do Not Remove Helmet!" warning added - many thanks to Steve May aka "Dr. Dirt" for the suggestion. Remember that you have a bunch of personal info here - try not to let someone steal it! If you leave the bike unattended (but locked up!) 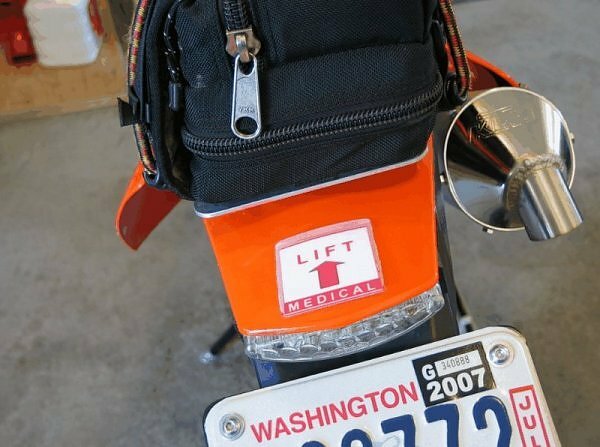 you might want to lay a strip of duct tape across the medical ID to keep it from getting messed with. 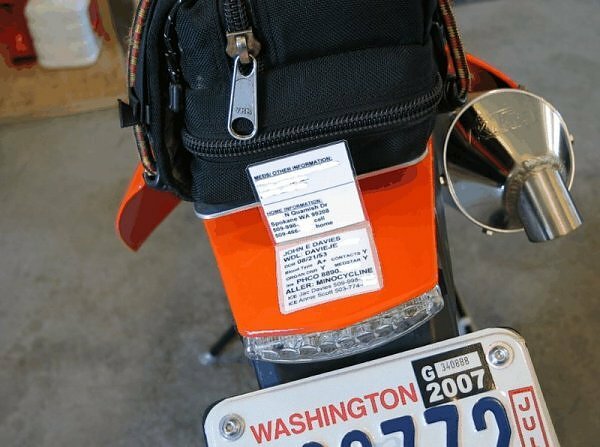 You will have to ensure that the label is readable and secure before each ride, but you shouldn't have to un-tape the edges to clean underneath it unless you have gotten into some really nasty muck. NOTES: If anyone can supply me with info about a good way to seal the bottom opening from dust intrusion, while keeping the flap easy to open, PLEASE let me know. A narrow strip of soft foam weather stripping tape might work. I just don't know where to buy something suitably thin. 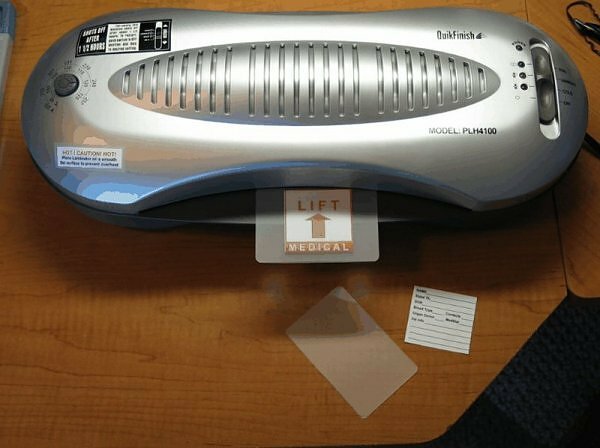 EDIT 01/28/10: I can NO LONGER RECOMMEND the following laminator. Mine ate a sleeve and rolled it around the feed roller. It took me three hours to repair the unit - it is NOT designed to be taken apart easily. It worked fine for a day or two, then ate another sleeve. This is UNACCEPTABLE !!! 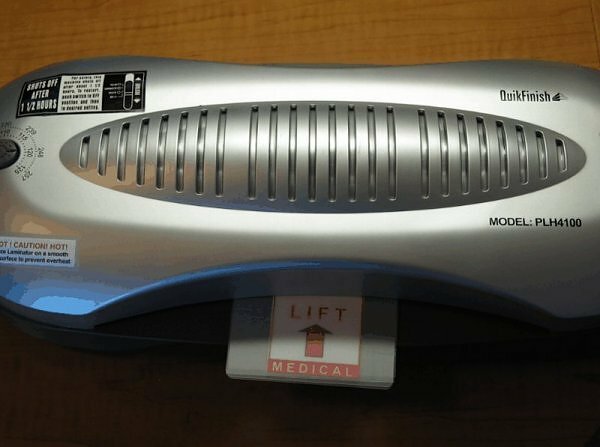 I think a laminator with a "caddy" (sleeve carrier) would be a better choice. 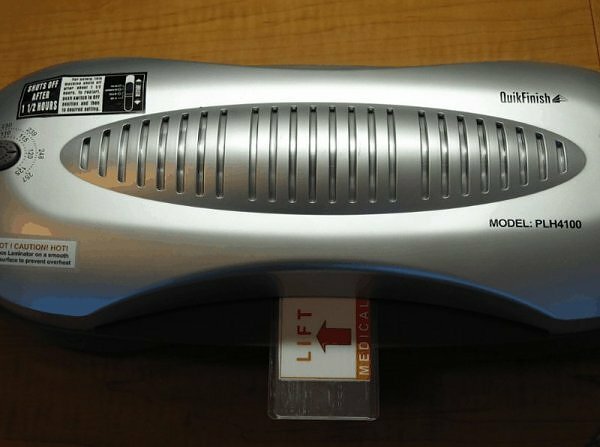 QuikFinish Model PLH4100 Hot Laminator. 10 inch capacity, 4 rollers require no "caddy" or 60 second cool down, Cold and Hot Laminate Modes, Foil Mode, infinite temp control (203 to 257 degrees F) commercial quality, nicely made and generally good reviews. Laminating sleeves: available at any office supply, but expensive when bought this way ($5 per 25). Order from http://www.laminator.com/ and save about 75% when buying in bulk (boxes of 100, with variety packs available). 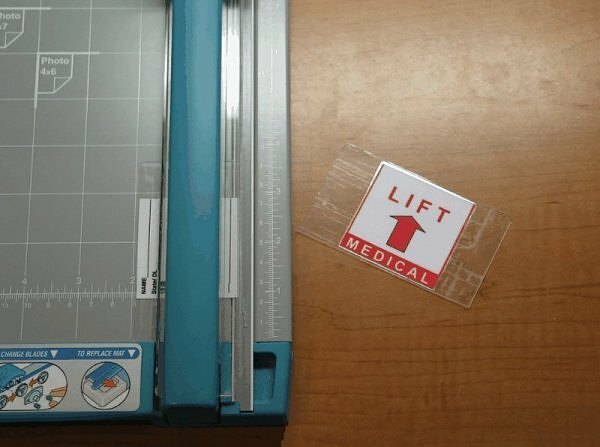 Luggage tags, Drivers License, Business cards, Bookmarks, 3x5, 8x10 etc etc in different thicknesses - 5 mil is the most common. UPDATE 11/9/11: I replaced it with a $20 Purple Cows 3051C laminator kit from the Costco store. This isn't shown at their website, so I don't know if they are found everywhere. There were some on the shelf last week. 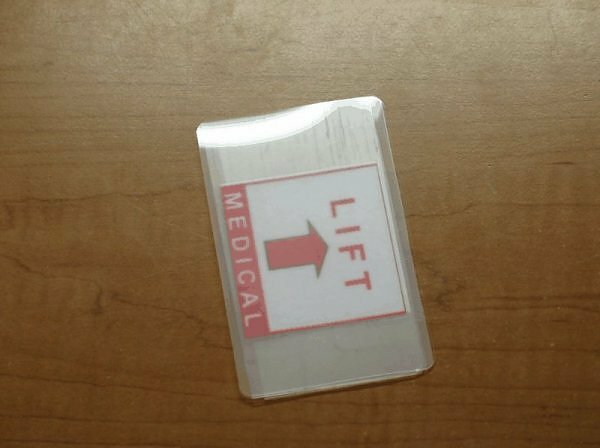 I haven't tried making any emergency medical ID tags yet with it, so I can't say how it works with multiple layers, but it works most excellently otherwise and is so durn cheap you can throw it away if it quits.